Like S. nigriventris, the evenspotted synodontis is a native of Africa. It swims in a normal position and often remains hidden during the day. 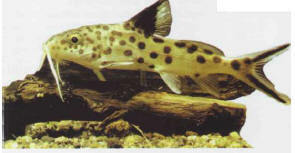 A few other species of Synodontis are available commercially. Size: 10 cm.